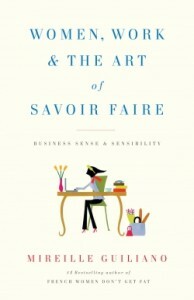 I finished reading Mireille Guiliano’s book Women, Work & the Art of Savoir Faire. Mireille is the former CEO of Veuve Clicquot; she also wrote the bestselling book French Women Don’t Get Fat. I don’t usually read advice books, but her book on business sense and sensibility was at the gym unclaimed, waiting for me to pick it up. It’s probably good karma for all the finished magazines I haul to the gym, bringing knowledge to those who need something to read while cycling. I skimmed over her sections on essential wardrobe items, etiquette during business meals, and recipes on what to serve when you’re entertaining guests. That was fluff and unnecessary. But she had some good insight on being successful, balancing work and personal, and being happy. Most people will tell you to follow your passion. “Choose something you love for a career and you’ll never have to work another day in your life.” I’ve always said the same thing. Her spin on that philosophy is enlightening. She says that in choosing your path, you must balance what you’re passionate about, with what you’re talented in, with what your opportunities are. I’ve never thought about career in terms of that trifecta. Definitely makes sense. I also like that she gives advice on becoming a CEO. “Move out of traditional women’s support staff service positions in HR or communications…you’ll need some experience and credibility in line positions with direct P&L and revenue accountability.” She said she wrote the book that she would have wanted to read early on in her career. It’s an interesting quick read from a fascinating woman.